Welcome April Showers! 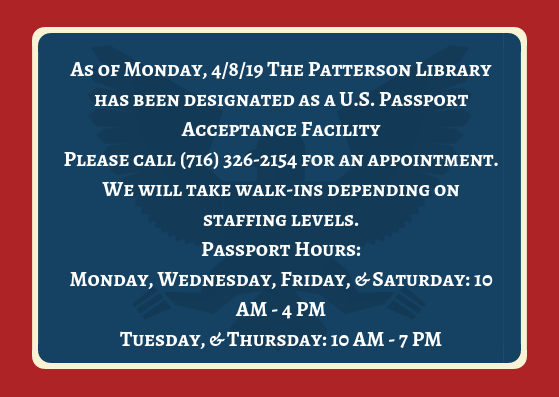 As March goes out like a lamb, the Patterson Library has tons of events to keep you occupied while we await May’s flowers. On Monday, 4/1 come down to Patterson Park at 11 AM for our Home Away from Home School group. 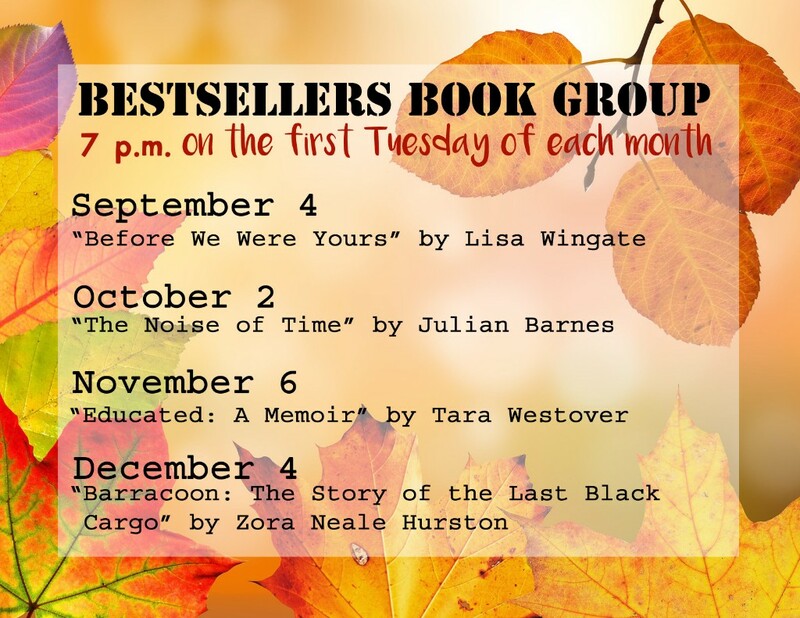 On Tuesday 4/2, we have the final Intro to Drawing Class with Kathy Gullo in the Main Reading Room at 6 PM, and Bestsellers Book Group will meet at 7 PM to discuss Susan Orleans “The Library Book” in the Crandall Archive Room. 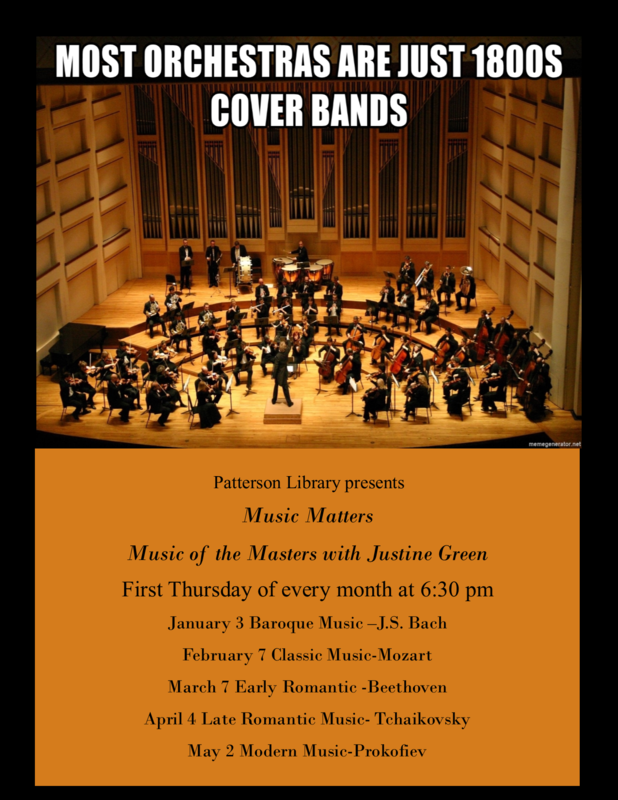 On Thursday, 4/4 we have Music Matters in the Main Reading Room at 6 PM, and Deb Eck’s Octagon Gallery Talk about her Secret Garden show, currently on display, also at 6 PM. 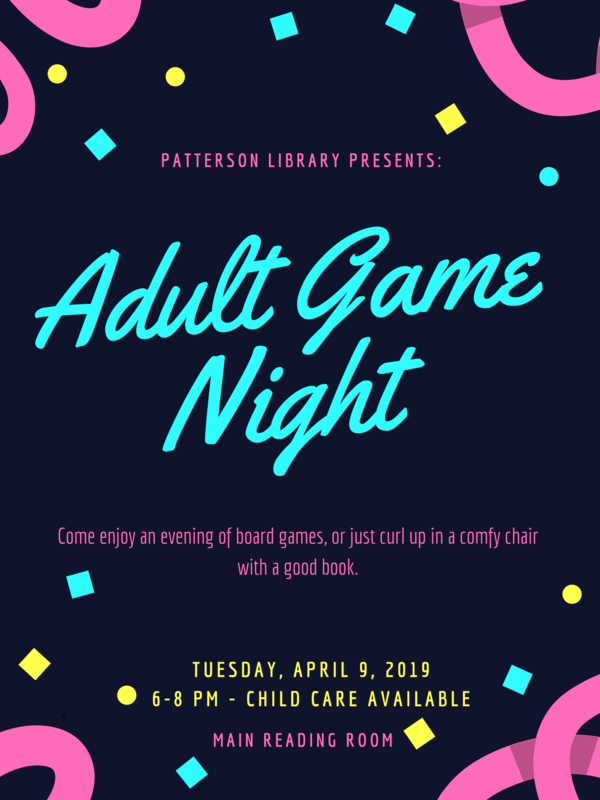 Tuesday 4/9 is Adult Game Night beginning at 6 PM, where you can come down to the library and play games, meet friends, socialize, or just pull up a comfy chair and get lost in a book, magazine, or puzzle – there will be free child care in the children’s room for this event, please RSVP to 326-2154 before the event. 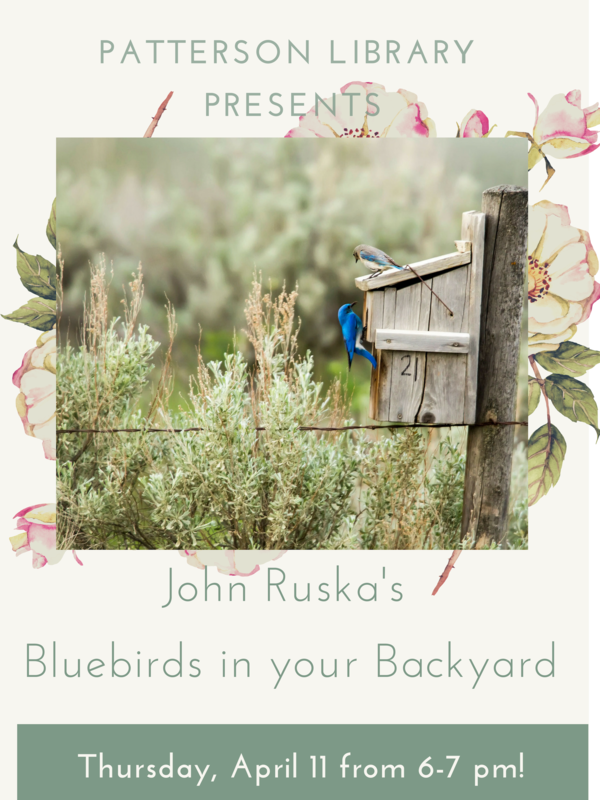 On Thursday, 4/11, John Ruska will present “Blue Birds in your Backyard” in the Main Reading Room at 6 PM. 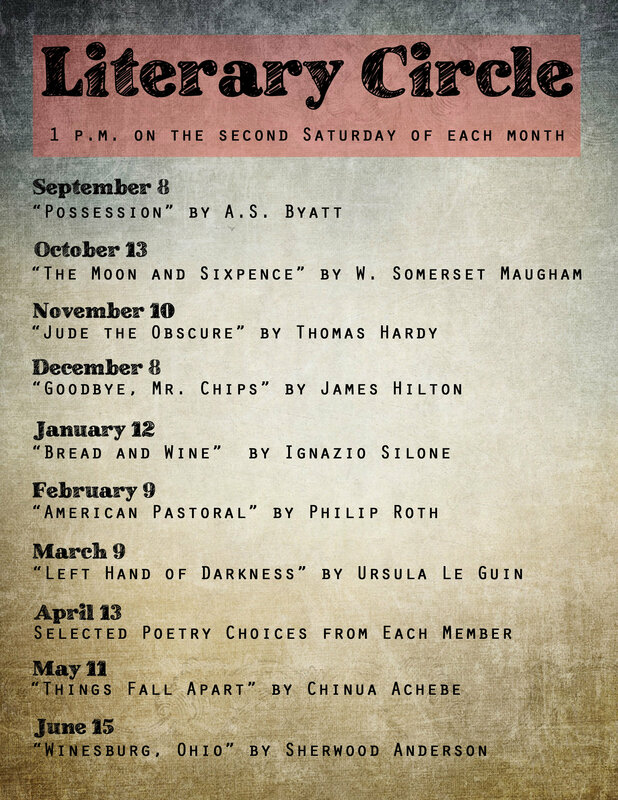 Literary Circle Book Group will share member selected poetry at their monthly meeting on Saturday, 4/13 at 1 PM in the Main Reading Room. 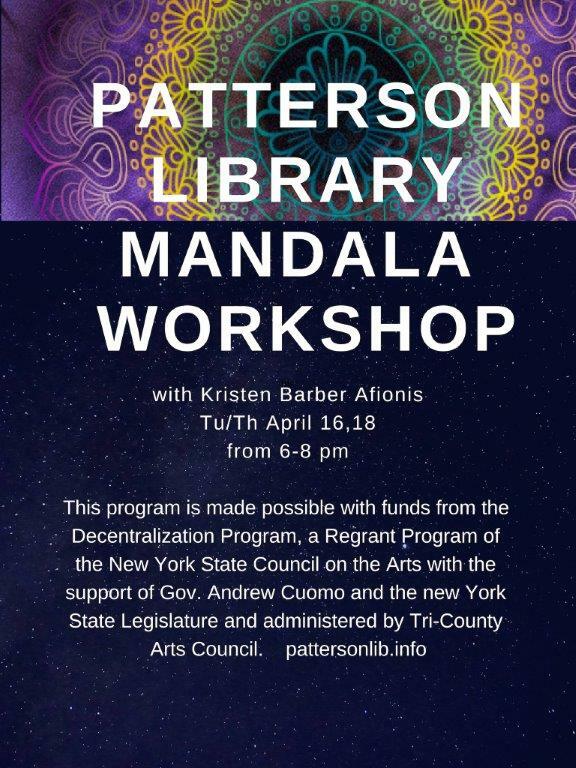 Tuesday 4/16 and Thursday 4/18 come learn about and make your own mandala, at our Mandala Workshop led by Kristen Barber-Afionis in the Main Reading Room, beginning at 6 PM – please call 326-2154 to reserve your seat. On Tuesday, 4/23 we will travel by armchair to Columbia in the Main Reading Room beginning at 6 PM, we will also have some Columbian delicacies, and Pilar de La Luz will be joining us to talk about her life in Columbia prior to the film. 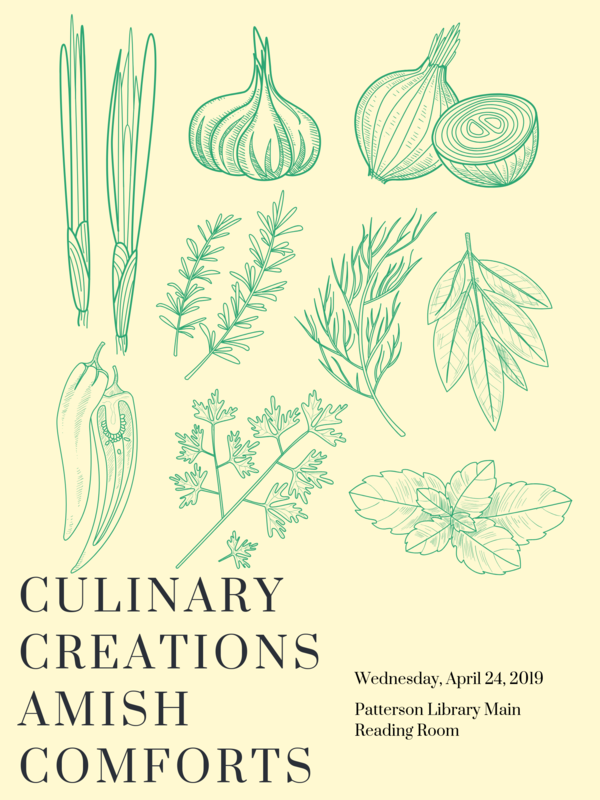 Culinary Creations Club will meet on Wednesday, 4/24 at 12 noon to enjoy Amish Comforts – you may sign up at the library and choose a recipe from one of our three cookbooks, or just bring your own recipe to this fun monthly gathering – no cooking experience needed! The kid’s will be able to come down to Patterson Library in the children’s room on Wednesday, 4/24 from 11 AM – 3 PM to enjoy a day away from home during the Spring break. Kids ages eight to seventeen may attend alone, and those under eight will need a parent to accompany them. We will have crafts, movies, games, and most importantly snacks! 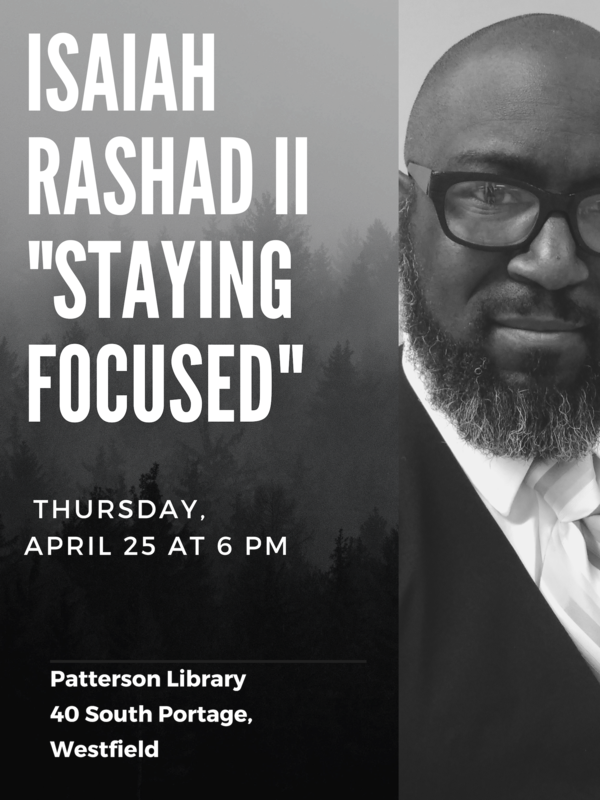 On Thursday, 4/25 local sculptor Isaiah Rashad will be joining us to talk about “Staying Focused” at 6 PM in the Main Reading Room. 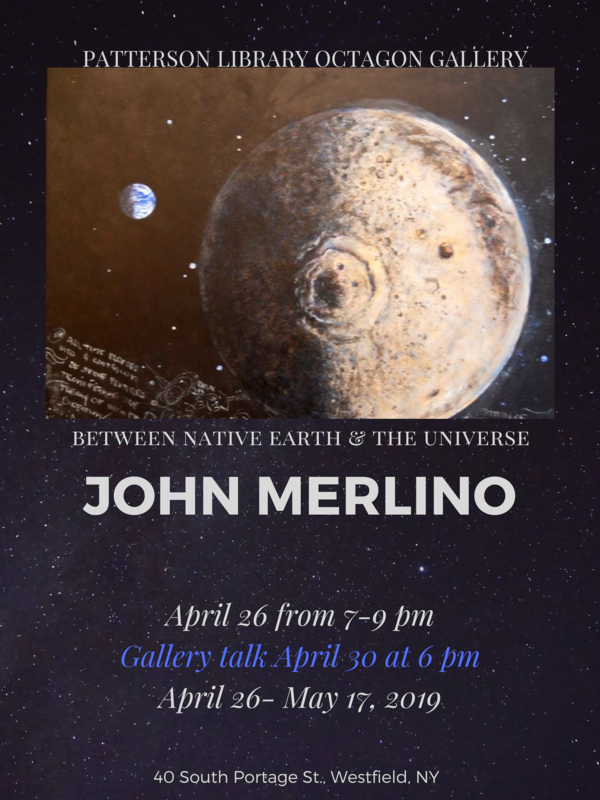 Friday, 4/26 features the Octagon Gallery Opening: “Between Native Earth & The Universe by John Merlino at 7 PM. Also on Friday, 4/26 we will have our second monthly Twe’Evening for our 10 – 12 year old friends to come and enjoy the library after it is closed with fun activities in the children’s area from 5 PM – 6:30 PM, followed by our monthly Teen Night from 7 PM – 9 PM, also in the children’s room. 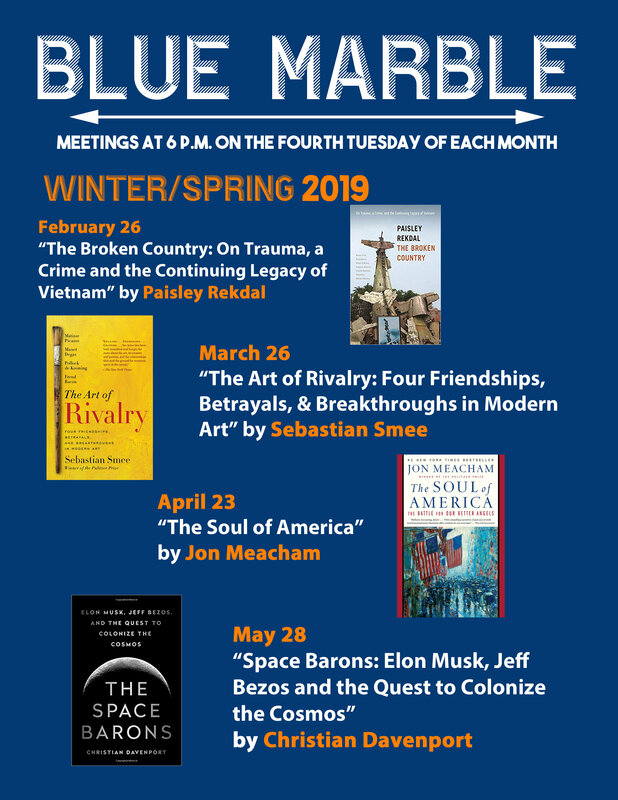 To round out April, on Tuesday, 4/30 we will host two events at 6 PM: our very own Blue Marble Discussion Group will be talking about “The Soul of America” by Jon Meacham in the Main Reading Room, and Jon Merlino will be giving an Art Gallery Talk in the Octagon Gallery. 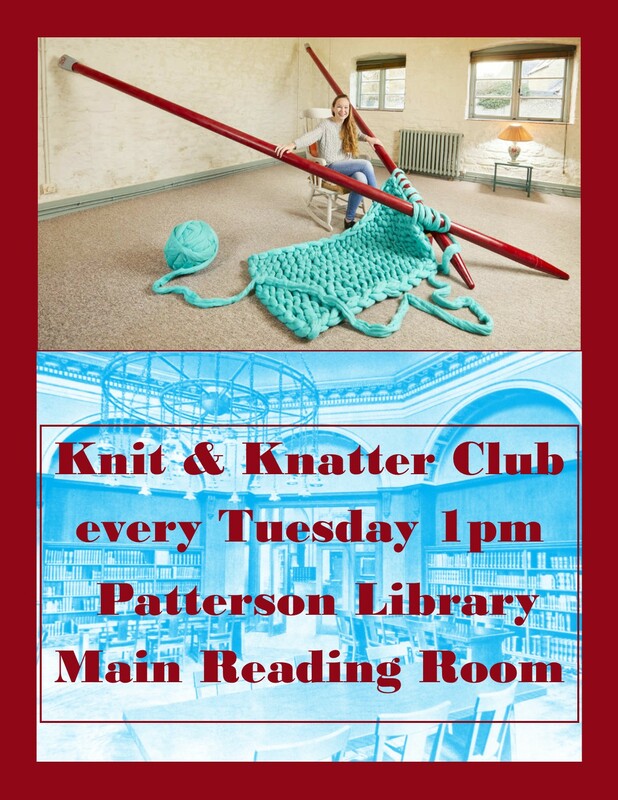 Keep in mind that every Tuesday at 1 PM, our new Knitter Knatter Club meets to knit, crochet and quilt in the Main Reading Room, and every Friday at 9:30 AM, Ms. Amy presents Storytime Fun in Patterson Park for all of our little friends, and their older siblings on days that school is not in session. 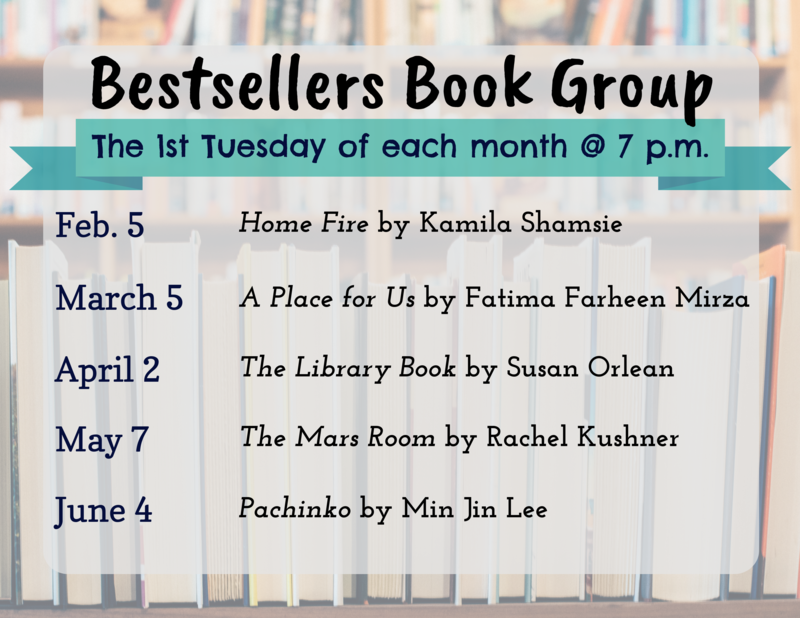 Our local writer’s group: Write Now will meet on Tuesday, 4/9 and Tuesday 4/23, at 6 PM, please check at the main desk for the location of this meeting within the library. Finally, please keep Saturday, 5/4 open from 6 PM – 9 PM, as Patterson Library hosts its first major fundraiser of the year: Patterson After Dark! We will host several wares of our local wineries, craft breweries, local merchants, musicians, and artists to bring you an amazing night with free supervised childcare in our children’s room. Tickets are $40 per person, and will be available at the Patterson Library and from any library trustee, or the library director. We cannot wait to host you for this fabulous event! Remember to check our website at www.pattersonlibrary.info for our full schedule events for the month of April, or pop on down to the library to pick up a printed calendar of events. Our events can also be located on the Westfield Community Calendar, on Facebook under Patterson Library, and in the local Penny Saver. If you would like to receive our monthly e-newsletters, please email the library director, Tom Vitale, at director@pattersonlib.org. John Merlino: "Between Native Earth & the Universe"
All are welcome to join at any time! Click on the flyers below to view each group's selections. Copyright © 2018 Patterson Library, All rights reserved.